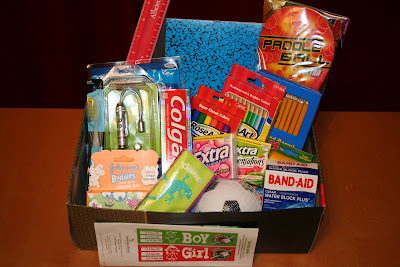 With the great school supply sales going on this month now would be a perfect time to collect items to donate. Many businesses, like Staples and Sleep Country, collect supplies to donate to children who are not able to afford it. 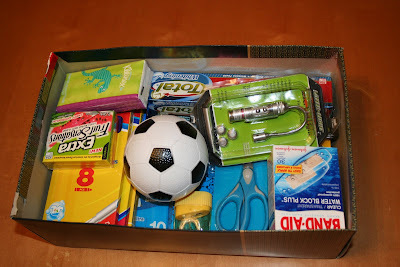 Another idea, which is my favorite, is to stock up on supplies to fill a shoe box for Operation Christmas Child. This week I hit Walmart and Target for their deals and came home with enough to fill a shoe box halfway. Then I looked through my stockpile from coupon shopping at Walgreens and Rite Aid and added personal hygiene supplies and a few other things. As you can see, the box is nearly full already which is great as I would like to keep the total cost at $20 including the $7 suggested donation for shipping. I have spent $10.72 so far so with the shipping I only have $2.28 left. I definitely want to put in a stuffed animal and am hoping to find one at IKEA for $.99 like I have in the past. I also want to put in a little car like a Hot Wheels or Matchbox which usually run between $.50 – $1. Then we’ll see how much room I have left and what other items from couponing that I can get for free. 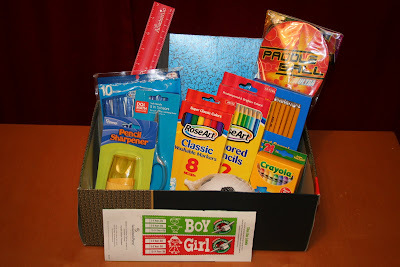 If you have participated in Operation Christmas Child what things do you like to put in there? What a great idea to start early!! Our church does Operation Christmas child every year. We were told last year that there is a big need for older boy boxes. My boys and I really enjoy shopping and they get the chance to "give" to a child that doesn't have as much as we do here. We always include a handwritten note with a picture of the three boys. Last year I did my donation on the website instead of paying it in the box and they sent me an email that our two boxes went to India. That was really fun to find out where they went. I love to include many of the travel sized personal items we can get for free (shampoos and soaps) with coupons. I love this event, my sons school does it every year! Thanks for posting and getting me thinking about it earlier.